I am sure anyone who has visited Yellowstone national park will agree to the magical beauty of this place. I feel extremely lucky to have got the chance to visit this natural wonderland.There are more geysers and hot springs here than anywhere else on Earth. 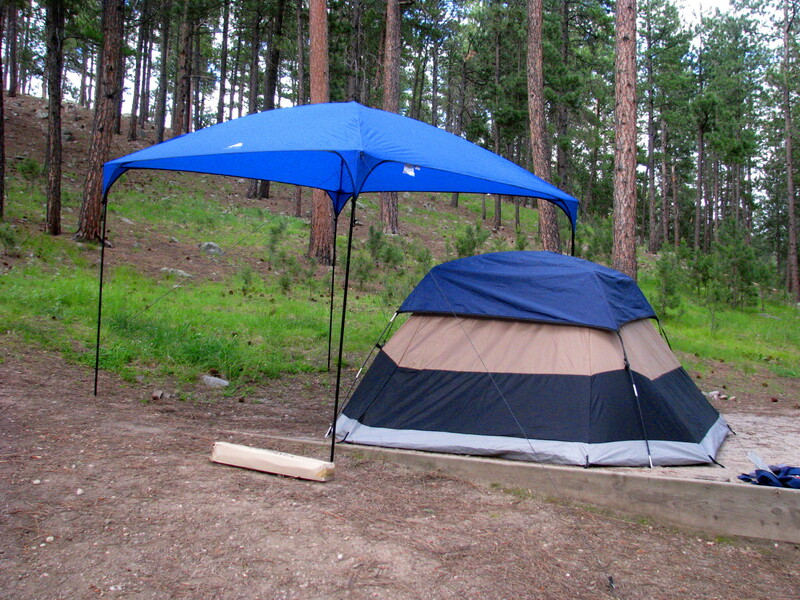 The park was established in 1872 as America’s first national park. A mountain wildland, home to grizzly bears, wolves, and herds of bison and elk, the park is the core of one of the last, nearly intact, natural ecosystems in the Earth’s temperate zone. Yellowstone National Park extends through Wyoming, Montana, and Idaho. The park’s name is derived from the Yellowstone River, which runs through the park.The Firehole River winds through the Upper Geyser Basin. Nomadic grazers, bison roam Yellowstone National Park’s grassy plateaus in summer and spend winter near warm thermal pools or in the northern section of the park. The huge animals use their heads like a plow to push snow aside in search of food. The Lower Falls of the Grand Canyon, at 308 feet high, is one of the most photographed features in all of Yellowstone. There are numerous vantage points on both the North and South sides of the Canyon. The 3/8 mile (one way) hike down to the edge of the Lower Falls is breathtaking. The Yellowstone begins south of the park, traveling more than 600 miles (965 kilometers) before it empties into the Missouri River in North Dakota. It is the longest undammed river in the continental U.S.
Tower Fall is 17 miles north of Canyon or two miles south of Roosevelt. The 132-foot waterfall plunges as a near-perfect water column until it crashes onto the rocks at its base. During the winter months, the frozen falls are accessible via cross country skies. Yellowstone National Park’s mile-long (1.6-kilometer-long) Upper Geyser Basin contains the world’s greatest concentration of hot springs and geysers. In the entire park, which spreads out over parts of Wyoming, Idaho, and Montana, there are more than 10,000 hydrothermal features—half of all such features in the world.Of this remarkable number, only five major geysers are predicted regularly by the naturalist staff. They are Castle, Grand, Daisy, Riverside, and Old Faithful. There are many frequent, smaller geysers to be seen and marveled at in this basin as well as numerous hot springs and one recently developed mudpot (if it lasts). Old Faithful is the most famous geyser in the park and is located in the Upper Geyser Basin. This geyser erupts more frequently than the other big geysers, erupting every 40 to 126 minutes. Old Faithful’s eruption lasts from 1 ½ minutes to 5 minutes on average, and reaches heights of about 105 – 184 feet, expelling 3,700 to 8,400 gallons of boiling water. Lower Geyser Basin is located north of the Upper and Midway Geyser Basins, between Madison Junction and Old Faithful Village on the Grand Loop Road. The primary access point is either the Fountain Paint Pot area or the Firehole Lake Drive. Midway geyser basin, though small in size compared to its companions along the Firehole River, holds large wonders for the visitor. Excelsior Geyser reveals a gaping crater 200 x 300 feet with a constant discharge of more than 4,000 gallons of water per minute into the Firehole River. Also in this surprising basin is Yellowstone’s largest hot springs, Grand Prismatic Spring. This feature is 370 feet in diameter and more than 121 feet in depth. There are a huge number of day hikes available in the park, and since many visitors travel only to the most popular geyser basins these trails provide an opportunity to see the park in a more natural setting. 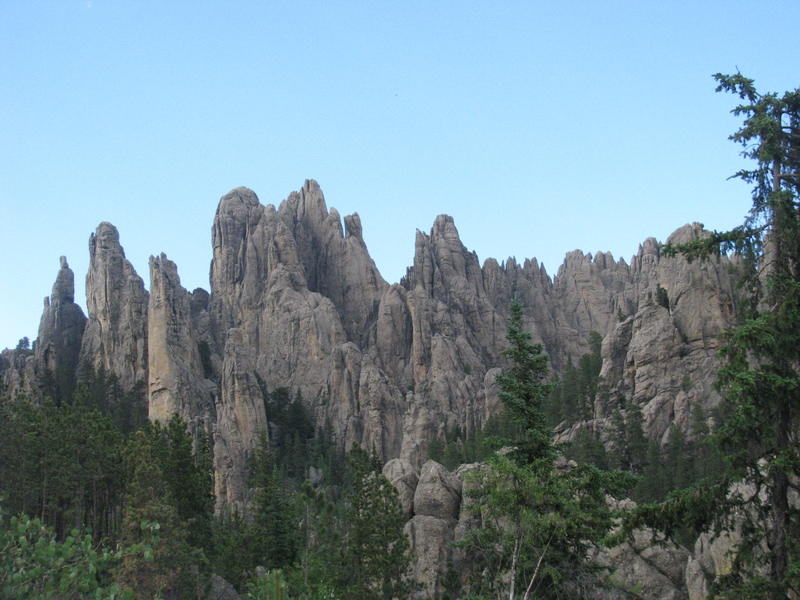 The next morning we went to see the Jewel caves which was about an hour’s drive from Custer State park. 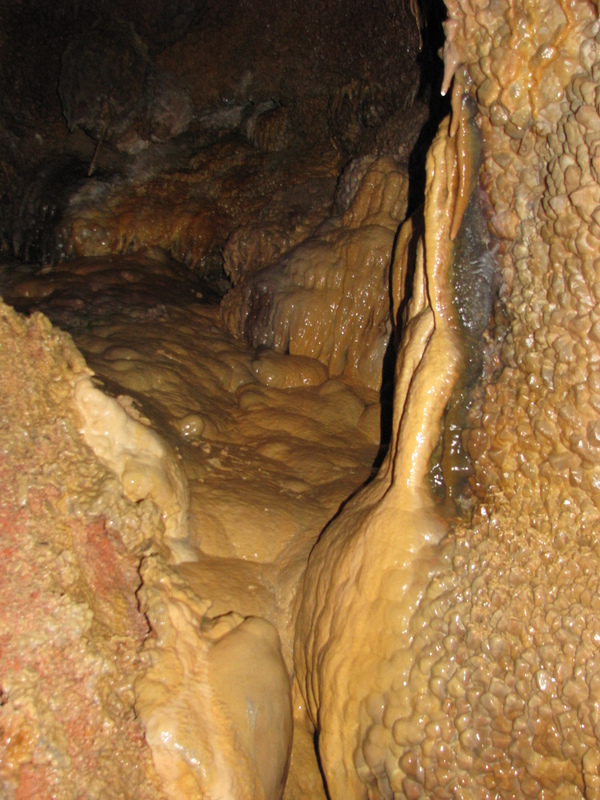 It is the second-longest cave system in the world with 160 miles of explored passageways. 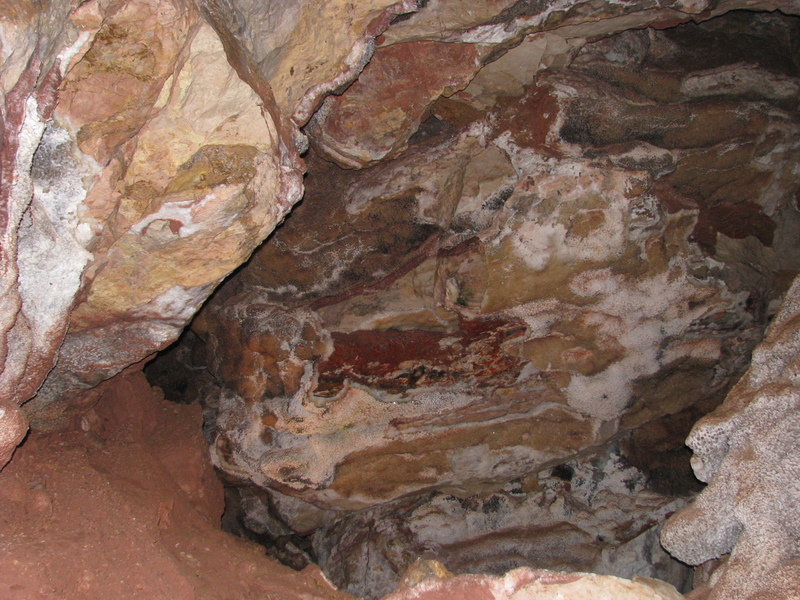 The cave got its name from the dazzling calcite crystals that illuminate the underground and lighted walkways of the cave. We took the scenic tour which was of 1 ½ hrs duration. 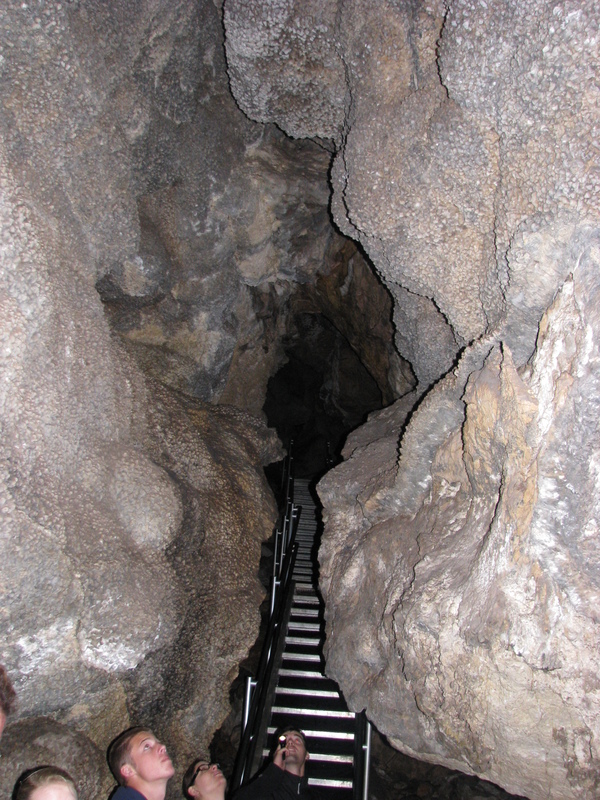 The tour guide took us down to the cave in an elevator and down several steps along a ½ mile loop. 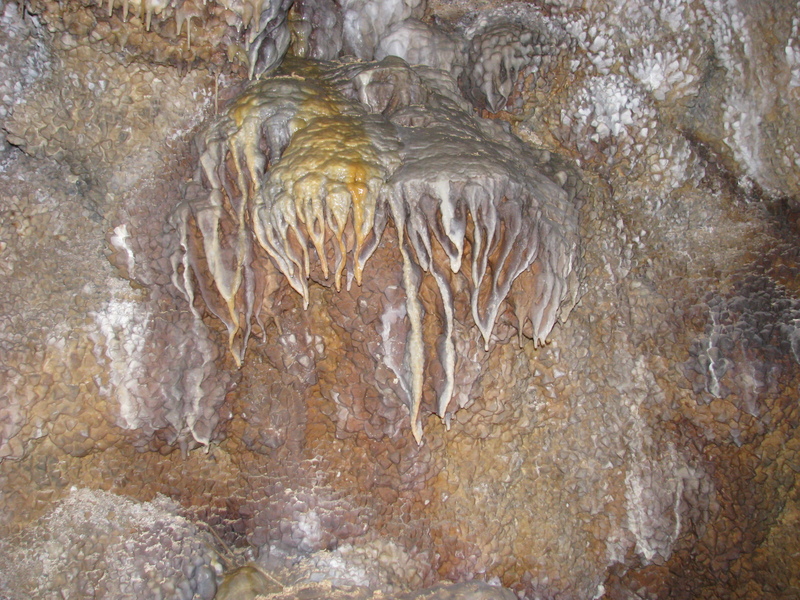 We saw many chambers decorated with calcite crystals and other speleothems including stalactites, stalagmites, draperies, frostwork, flowstone, boxwork and hydromagnesite balloons. 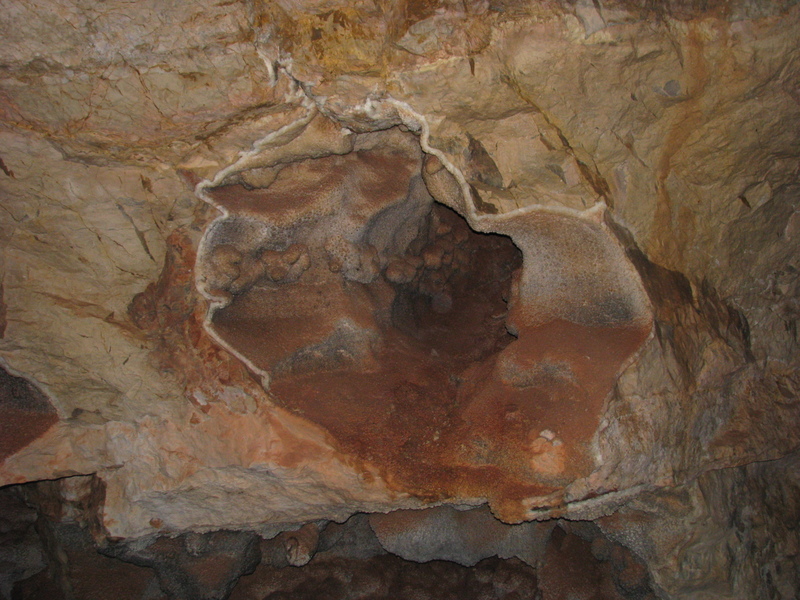 The cave is an important hibernaculum for several species of bats. 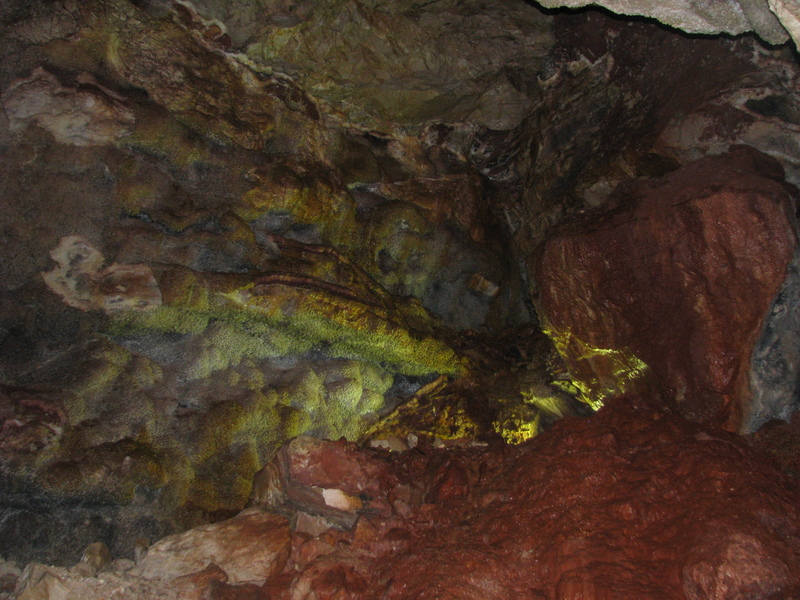 At one point, the guide asked us to stand together and then he put out all the lights inside of the cavern. It was quite exhilarating to be in total darkness. 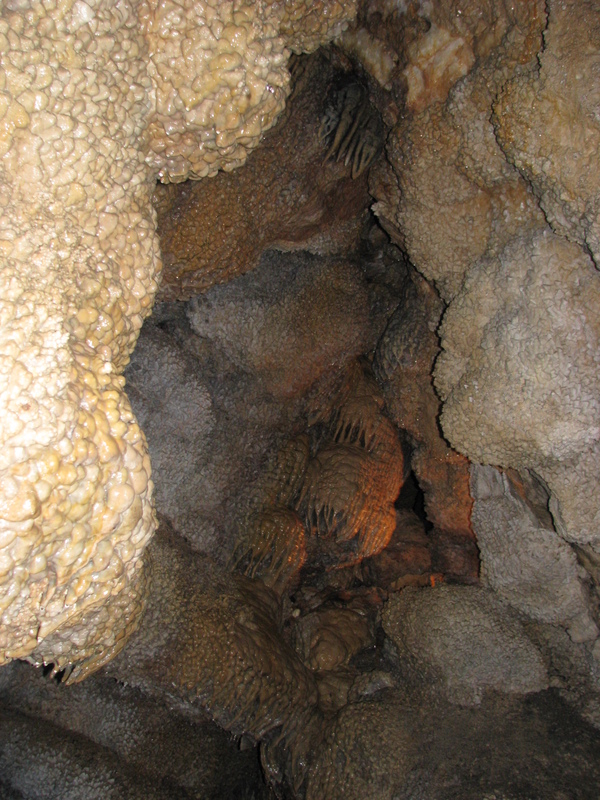 This was one of the most fascinating cave tour I have ever had. After the magical experience of Cosmos we drove towards Badlands national Park. One of our longest road trips was the one we made on the Memorial Day long weekend of 2010 to South Dakota from Chicago. 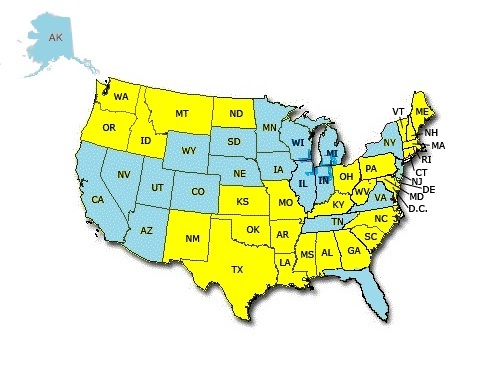 We covered a total 2,500 miles approx. round trip. There are many things to cover up in this trip and so I will have to make different posts for them. We started our journey at around 4 pm from Chicago on 4th of July 2010. Our first stop was Galena. After a little sightseeing and filling our bellies, we headed towards Albert Lea where we put up for the night. 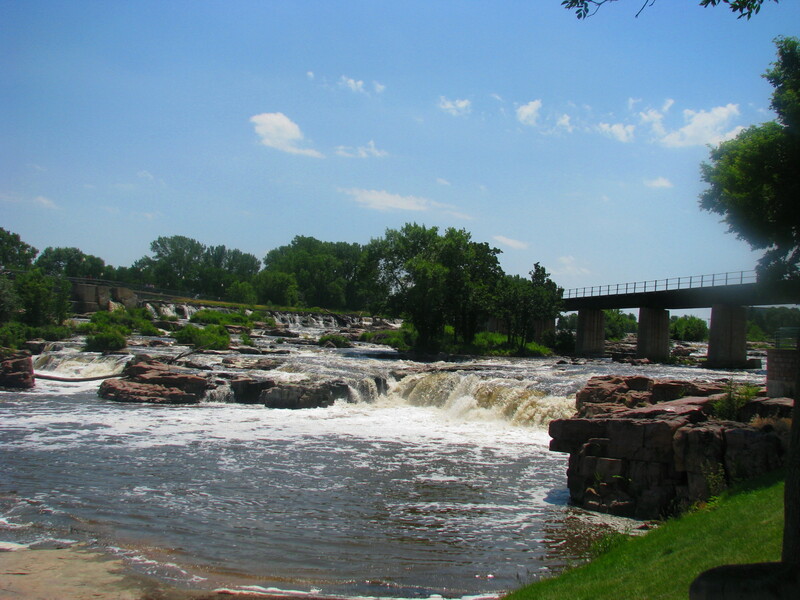 Next morning we headed towards Sioux falls which is located at the intersection of two major interstates, I-90 and I-29, . The cool water of the falls helped to beat the summer heat and we had some great time there. We rested in the park for awhile and enjoyed some snacks too. 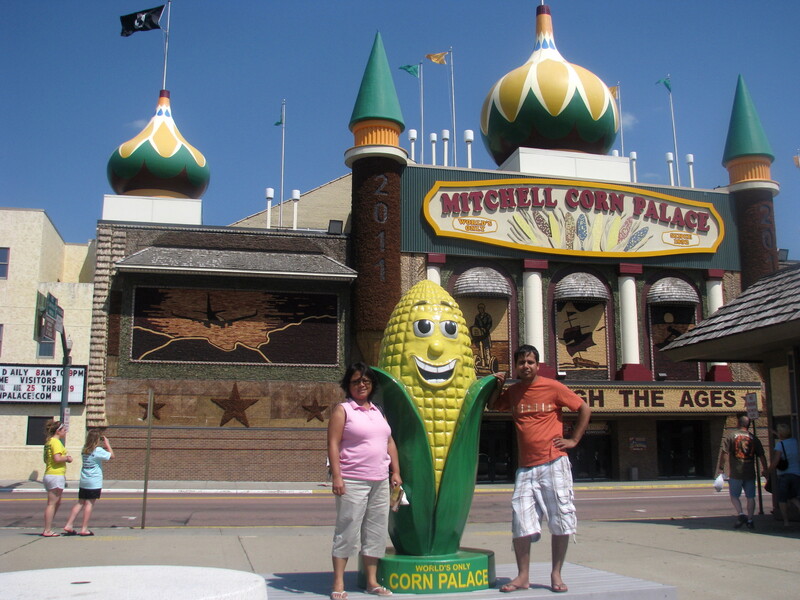 From there we moved on to see the Corn Palace, an amazing work of corn art. 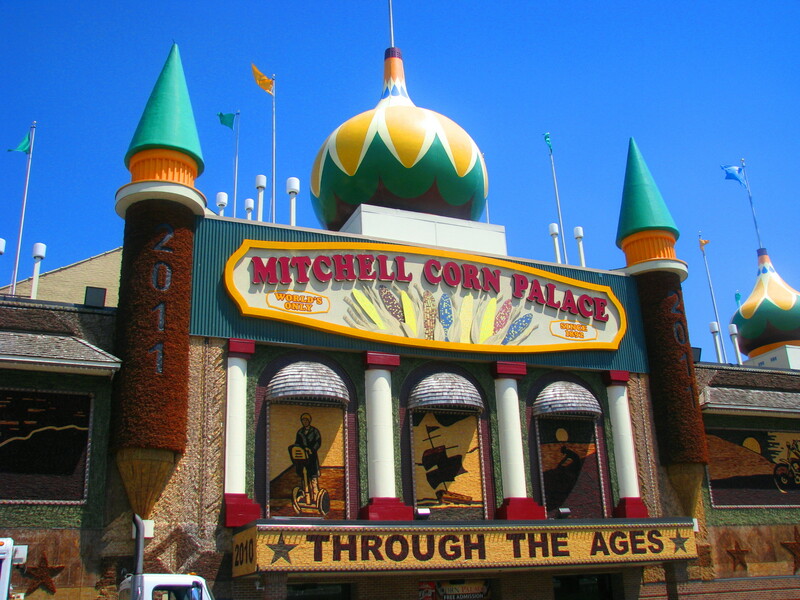 The themes keep changing every year since 1892.Every spring, the exterior of the palace is completely covered with thousands of bushels of native South Dakota corn, grain and grasses that are arranged into large murals. I got myself a cup, shaped like a corn from the souvenir shop :). There wasn’t much to see and do around and so after having a quick local made ice cream we headed towards our next destination… Custar state Park, where we put a tent for the night. I say that’s the best part of making a road trip.. carry your home along with you. 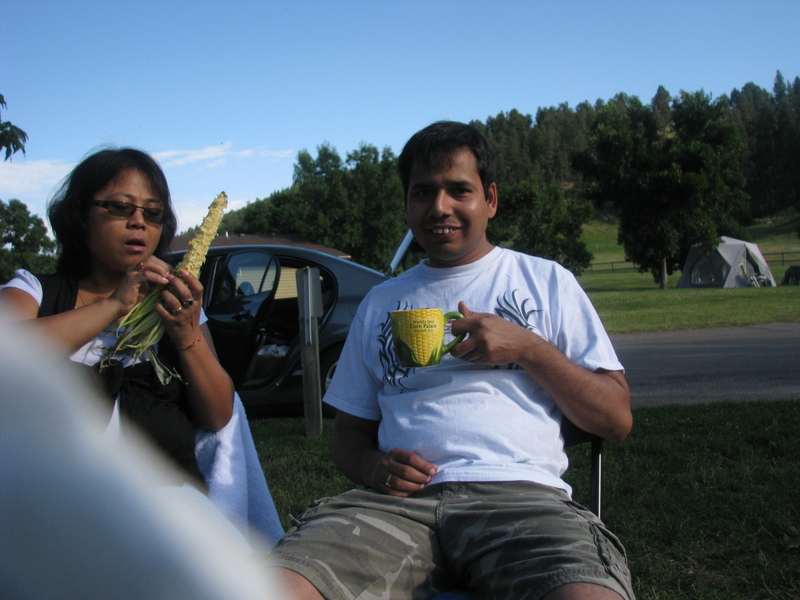 Having “bhutta” and tea in the cup bought from the corn palace the next morning. After breakfast, we headed towards Mt Rushmore which was just about an hours drive from the park. 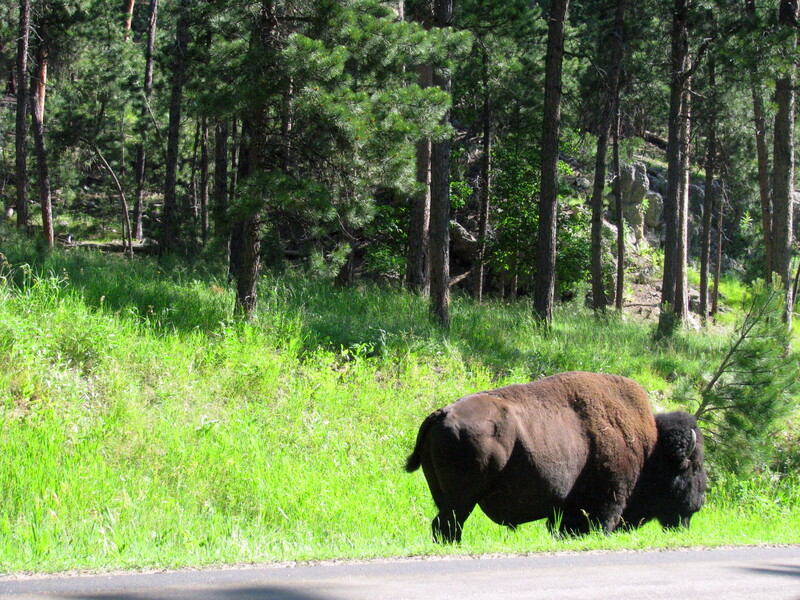 On the way we saw a bison by the roadside and stopped at a safe distance for a quick shot. The drive along the scenic Iron Mountain road itself was awesome.The road is famous for the “Pigtail Bridges” that allows travelers to drop or gain altitude quickly. The scenery along the highway is bewitching. The three rock tunnels are simply stunning. 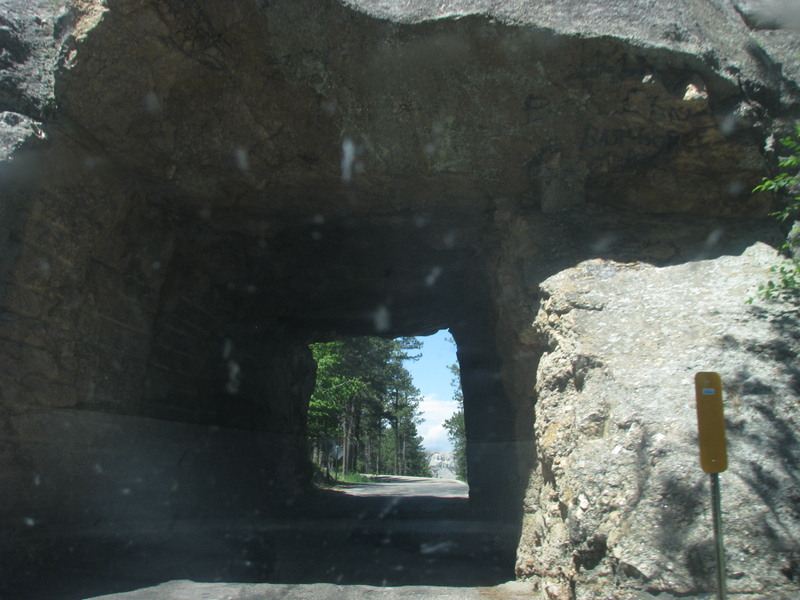 We could see Mt Rushmore at certain points along the drive and the heads of the Presidents through one of the tunnels. I tried to capture a shot of it but as the sun was ahead of us, the dirt in the window screen was more prominent than the view ahead. We reached Mt Rushmore by noontime. There was a huge rush as it was a long weekend but we managed to get a parking place. 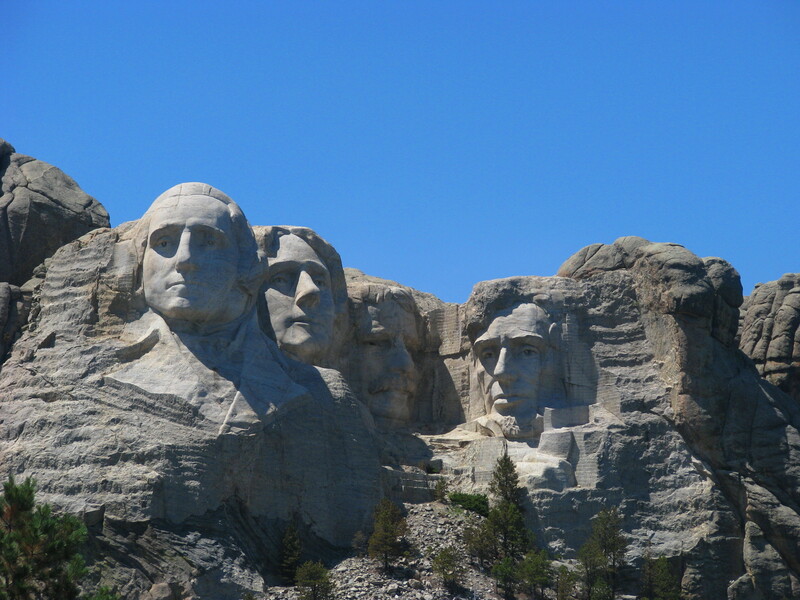 I was awestruck by the huge sculptures of the four famous US Presidents. The entrance was lined up with flags that gave an awesome view. It took 14 years to build the faces of George Washington, Thomas Jefferson, Theodore Roosevelt and Abraham Lincoln in these mountains. There is a pathway that leads to a close view of the presidents and also a sculpture museum showing of all the tools used in the construction and also videos and pictures. We wandered along for awhile clicking pictures and admiring the sculptures. Suddenly dark heavy clouds flooded the sky and we decided to leave. As we left the parking lot we were caught by a drizzle of passing showers. I took a last glimpse at the sculptures which seemed to be weeping in the rain. We took the Peter Norbeck Scenic Byway while returning. 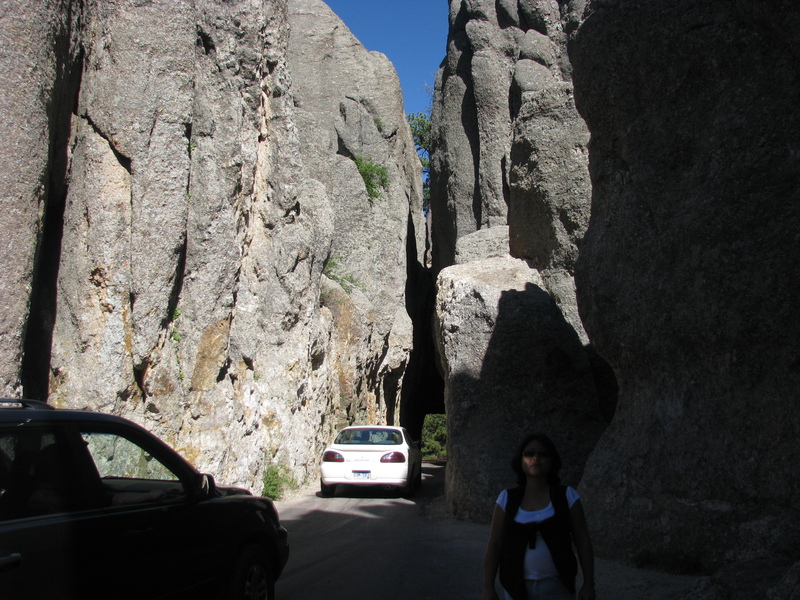 With the sharp turns, low tunnels, and impressive granite spires, this was one of the most amazing road I had ever seen. The drive was a little nerve racking too because of the height but had an amazing view. We stopped by the pine and spruce forests to get a few more clicks. We saw a couple of adventurers climbing up the pointed rocks. 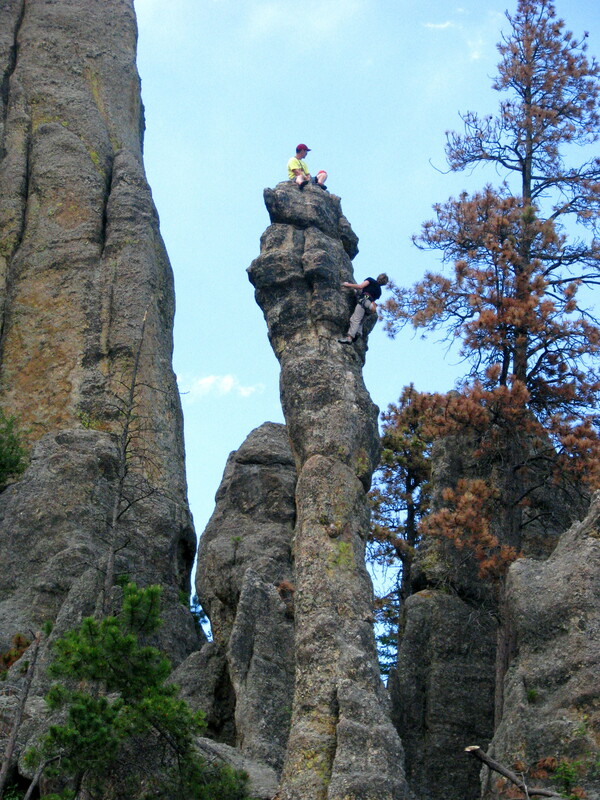 After leaving Crazy Horse we headed back to our campsite at Custer State park. I will put the next part of this trip in another blog. Yesterday we went to see the Minnehaha waterfalls located at the intersection of Hiawatha Avenue and Minnehaha Parkway. It was completely frozen though its just the beginning of winter. Though a danger sign warns people to stay away from the fall, there were people quite close up to the fall and so we too followed them and got some pretty good shots. The staircase leading down to the fall was full of snow and ice and pretty much slippery. Tip:Click on a photo to view the slide show. ready to fall or melt?? 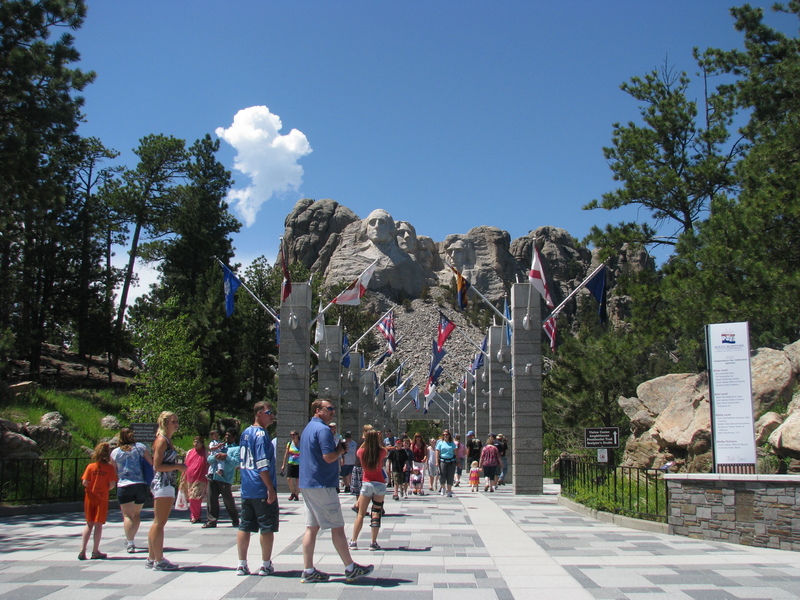 I suppose one of the craziest things we ever did was to visit Crazy horse memorial located along U.S. Highway 16/385, between Hill City and Custer, South Dakota just 20 miles from the world-famous Mount Rushmore and just outside Custer State Park. This was in 2010, when we visited the Badlands and Mt Rushmore. I call it crazy because we had a lot of expectations to see the world’s largest mountain carving dedicated to the American Indian Nation. However, on finding that it was not even 10% complete (only the face) our hopes were shattered. Definitely was expecting more than that. It is dedicated to Crazy Horse, a warrior of the Oglala Lakota tribe, and shows him riding a horse and pointing into the distance. I read a lot about it in the internet before the trip and thought it would be fascinating to see the giant sculpture which when finished would stand 641 feet wide and 563 feet tall. The scale of the project is however pretty awesome. By comparison, each head on Mount Rushmore is approximately 60 feet tall. Crazy Horse’s head will be 87 feet tall. But unfortunately the work still remains incomplete even after 70+ years since it first started in 1948 by Korczak Ziolkowski. He died in 1982, but his wife and seven of his ten children are continuing his dream. 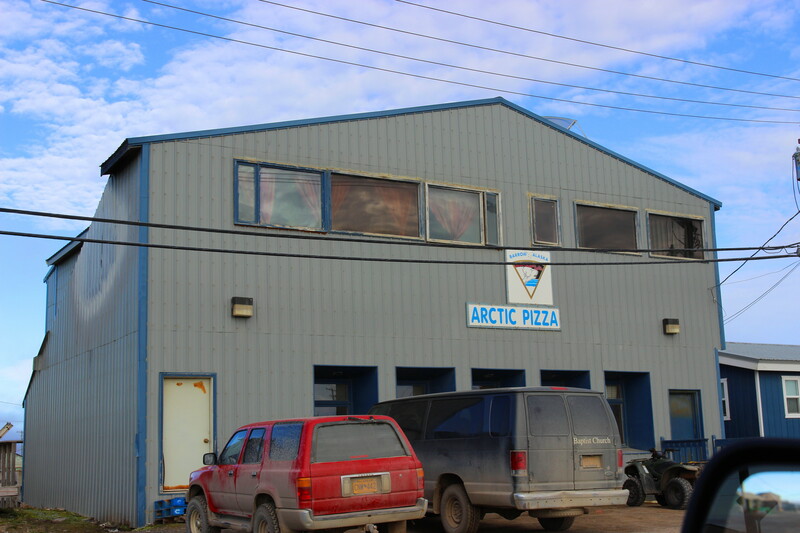 They accept no state or federal funds and depend on the fees and donations from visitors, the reason for its incomplete state. I was even more disappointed when we were told we need to pay $125 tour to go to the top of the monument(to see just the head) as we had already paid $10 at the entrance and another $4 per person for the 25 mins bus tour to take a closer look. So we dropped the idea of going to the top. 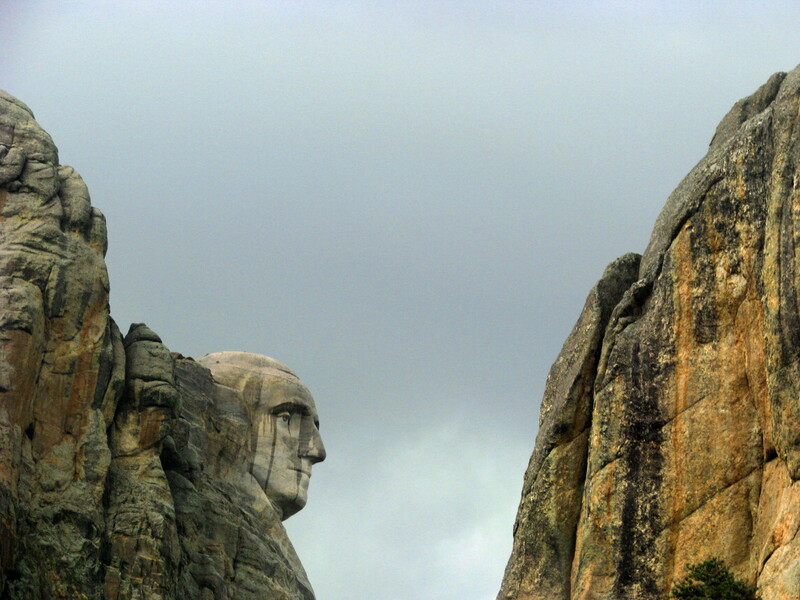 There are various lookout points where you can see a side view of the crazy horse monument. The incredible story behind this major project is that Crazy Horse was a legendary warrior and leader of the Lakota Sioux, celebrated for his battle skills as well as his efforts to preserve Native American traditions and way of life. Resisting efforts to force the Sioux on to reservations, he fought alongside Sitting Bull and others in the American-Indian Wars, and was instrumental in the defeat of George Armstrong Custer’s forces at the Battle of the Little Bighorn. After surrendering to federal troops in 1877, he was killed amid rumors of a planned escape. There are a lot of plans for this monument, but as this is a privately funded project, I doubt it will be finished in the near future. The informational video is interesting, the information center is full of Native American artifacts, and of course lots of items “for sale”. If you are in the area, there is no reason not to stop by and see this amazing engineering feat.